Summary: When editing a Word document, the Find and Replace tool invariably gets used quite a lot. How much do you really know about this ubiquitous tool, however? Discover everything you need to know in order to use Word's Find and Replace capabilities in surprising ways. Most word processing programs provide tools to assist with editing a document. Word is no exception—it includes tools that allow you to repeat actions, jump to different areas of your document, select text, and perform a variety of other tasks. The most powerful and often-used tool in Word's editing arsenal, however, is the Find and Replace tool. Word's Find and Replace tool is capable of doing so much more than finding simple pieces of text and replacing them with other pieces of text. With it you can search for different combinations of text and formatting, replace what you find with a flexible array of items, and even search and replace special characters. The Word Find and Replace e-book introduces you to the power and sophistication of Word's Find and Replace tool. Here you learn everything you need in order to master all the intricacies of finding and replacing text, formatting, and special characters. You even learn how to master the super-powerful "wildcard searches" available in Word. Shortly you will be doing searches that you never dreamed of doing before. Word Find and Replace is an invaluable source for learning how to harness the full power of Word's search and replace capabilities. You are introduced to topics in bite-sized chunks, pulled from past issues of WordTips. You can learn at your own pace, exactly the way you want. To get an idea of the value packed into Word Find and Replace, take a look at the complete table of contents. Word Find and Replace provides a valuable resource for focused information that can't be matched by any other single source or computer book. How much does this valuable resource cost you? 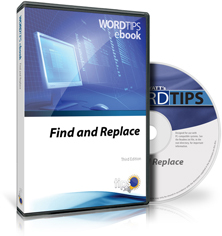 You can download your own copy of Word Find and Replace for the low price of only $19.99. Place your order today! For users of Word 2007, Word 2010, Word 2013, and Word 2016. You can also order any of the Word Find and Replace titles by calling our order line: 307-200-0450.